Aesthetics Transform your space with beautifully designed Architectural and Designer keypad styles, a variety of keypad button configurations, and faceplates in an assortment of colors, finishes, and materials. Convenience Create just the right light for any activity or set moods in specific areas of your home—all at the touch of a button. Technology Lutron’s patented Clear Connect RF technology sets the bar for reliability, so you can trust your system will work with precision and accuracy every time you use it. 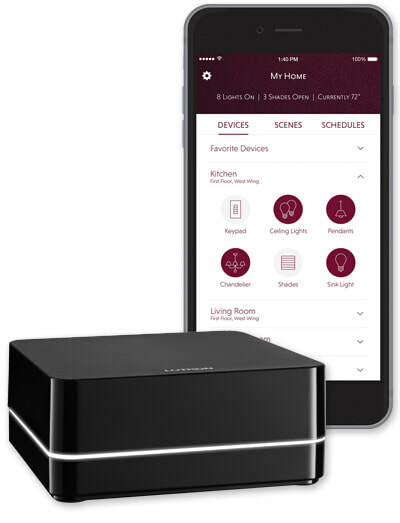 Lutron Connect Bridge and the Connect App The Lutron Connect Bridge creates a link between HomeWorks QS and the cloud, enabling control, integration, and monitoring of a HomeWorks QS system from a smartphone or tablet using the Lutron Connect app. Add personalized scenes to control multiple lights, shades, audio, and temperature together with the touch of a button. Create an “Entertain” scene that dims lights, lowers shades, raises the temperature, and plays your favourite tunes as your guests arrive. Or create a “Goodnight” scene that turns off all lights, lowers shades, and sets back the temperature before you drift off to sleep. Schedule lights and shades to adjust automatically at set times of day. Turn on landscape lights at sunset and turn them off at sunrise. Turn lights on to a soft level and slightly raise shades every morning as you head into the kitchen for coffee. he geofencing feature controls lights based on your location. Maybe you always leave the entryway lights on as you head out the door in the morning? Geofencing will turn them off for you once you’re out the door. It can also turn lights on for you when you come home. Control from anywhere Control lights, shades and temperature in the comfort of your home or from anywhere in the world – the office, the airport, the beach – so lights aren’t left on or shades aren’t left open when you’re away. 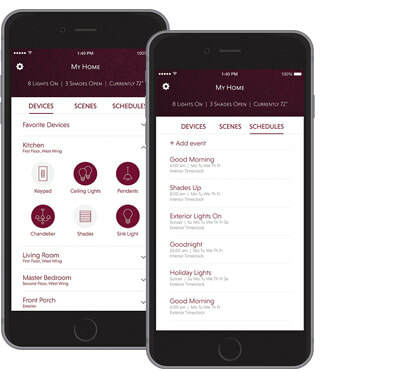 Low battery status alerts Receive low battery status alerts for sensors, Triathlon shades, and more, right from the app.Expand your smart home system HomeWorks QS works with smart home solutions from other best-in-class brands, for voice, audio, temperature control, and more.